Welcome to Katfrog's Corner: Review: "I Am Number Four"
Review: "I Am Number Four"
Imagine that you are from another planet, hiding out on Earth with your own guardian, waiting for these killers to find you and kill you. 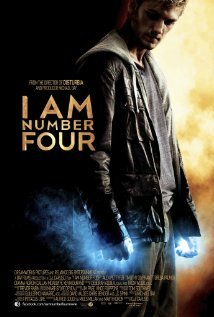 This is the premise behind the movie, "I Am Number Four". Small spoiler alert: In the beginning of the movie, you learn that nine children from the planet Lorién escaped to Earth after the Mogadorians invaded their planet, killing everyone. Now, the Mogadorians are on Earth, tracking down and killing the remaining Loriéns before moving on to invade Earth. I find myself pausing, attempting to describe the movie without giving away an already thin plot. This movie is a combination chick flick and action movie, ready made for a teenage date. The Bad Guys are Bad Guys, there is no confusion there. The protagonist, John Smith, sounds like an alien James Dean from "Rebel Without a Cause", only here it would be "Alien Rebel With a Cause". Henri, John's guardian, is Stoic Man, able to confront any situation with extreme calm. Sarah Hart, the Love Interest, is the former Shallow Girl who Found Herself. And Sam is the Classic Geek who gets bullied by the football team and wants to find UFOs when he grows up. The acting in the movie is good, within the limit of the movie. There are a few two-dimensional characters, but they tend to show in only a few scenes. Between the action scenes and soliloquies explaining the plot, there exists only a limited amount of screen time for character growth. My favorite character, by far, was Sam, the UFO geek. I don't know if it's because I can relate to his geekiness in general or I can admire his passion despite heavy criticism from everyone around him, but Sam strikes me as a survivor and a nice guy. On the other hand, the special effects in the movie rock! I like a good alien throwdown. The movie is based on a book by the same name that's part of a series, Lorién Legacies. While I wouldn't pay theater prices to see this movie or its sequel, I do want to read the book and see what I think. Overall, I give this movie 5 out of 10 stars. Thanks for the review, saving me having to watch it!